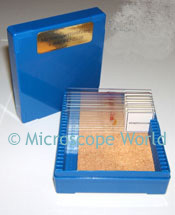 Prepared microscope slides are great learning tools for children. The slides are each labeled and ready to view under the microscope. No need to prepare the slide or collect samples. This prepared slide is smooth muscle, viewed at 400x magnification. This prepared slide is one of nine slides in the Musculoskeletal Histology Slide Kit offered by Microscope World. This prepared slide is hydrodictyon (found in clean water irrigation or streams). This slide is one of ten found in the Zoology prepared slide kit.